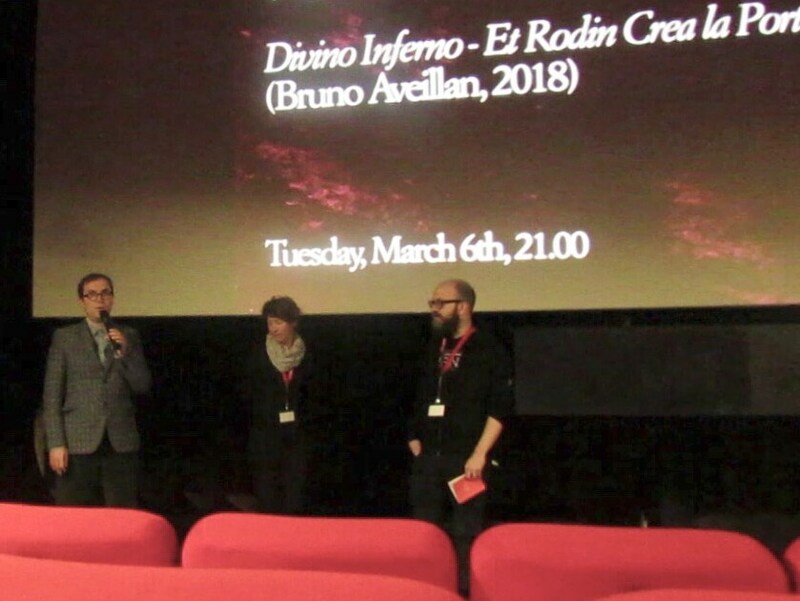 The XXV Edition of the International Film Studies Conference in Gorizia (Italy) welcomed in March 2018 a successful screening of Bruno Aveillan’s film Divino Inferno. Rodin and The Gates of Hell (2017), written with Zoé Balthus. This amazing documentary movie was suggested by Jean-Baptiste Chantoiseau – who teaches Film Studies and Art Theory at the Sorbonne-Nouvelle University (Paris 3) and works at the Musée Rodin in Paris – to explore in a sensitive and sensible way this year’s theme: Cinema and Contemporary Arts. 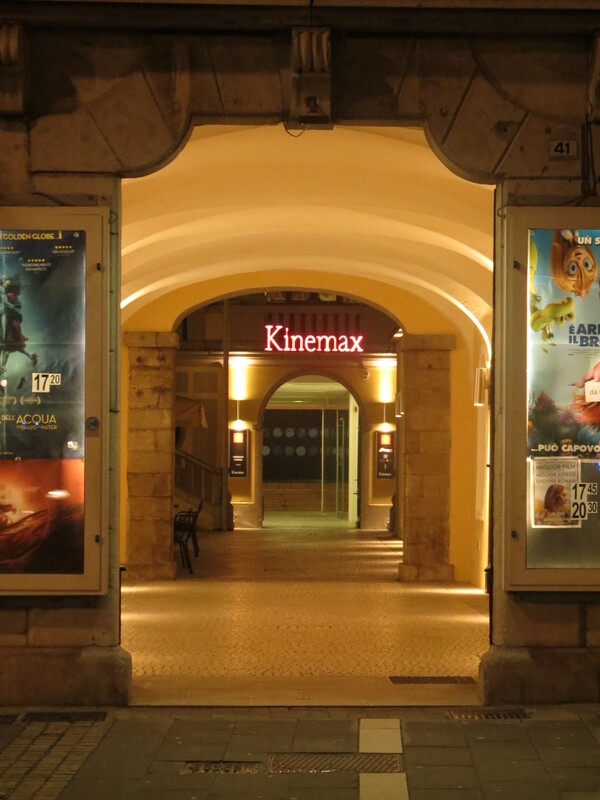 The screening took place in a beautiful and modern movie theater: Gorizia’s Kinemax. Bruno Aveillan’s Divino Rodin. 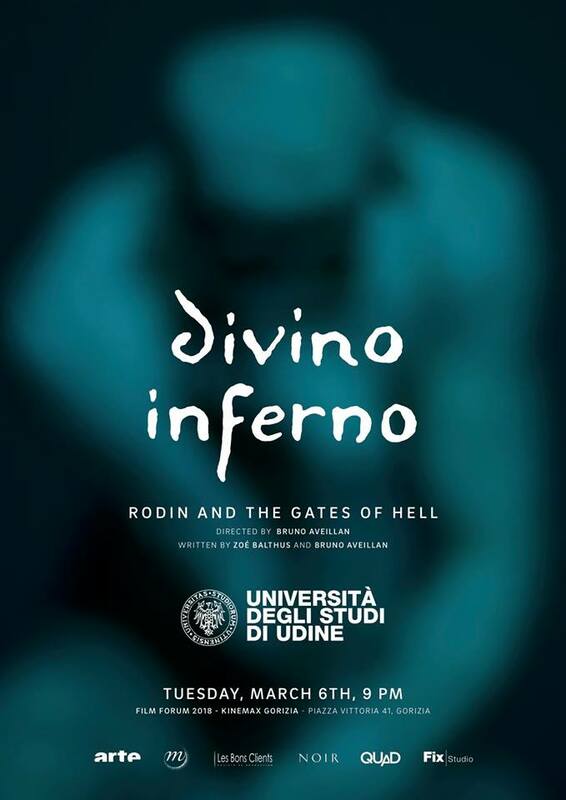 Rodin and The Gates of Hell offers an unseen dialogue between sculpture, dance, photography and cinema. It proposes an unexpected portrait of the sculptor which was highly appreciated by the public. A lot of spectators discovered indeed that despite a worldwilde celebrity, the complexity and the richeness of Rodin’s artworks still needs to be explored and enlightened. Bruno Aveillan challenges, with creativity and modernity, all the usual codes of Art Films to broaden the viewer’s perception. His starting point are Rodin’s Gates of Hell. 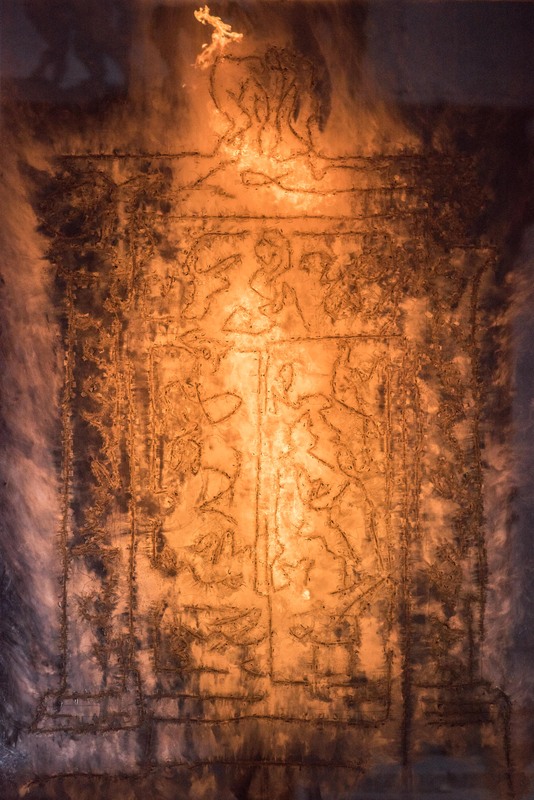 The artist had been working on them for at least 20 years. Actually he was still thinking and dreaming about his project when he died in 1917. As Antoinette Le Normand-Romain explains it in The Bronzes of Rodin. Catalogue of Works in the Musée Rodin (2007): “The Gates of Hell […] are the result of a long gestation, which begun in 1880. » Between 1880 and 1890, Rodin created around 200 figures; working feverishly on what could be seen as « the diary of his life ». © On the left, view of Mircea Cantor’s Art performance. On the right, photography by Nicolas Gouhier. 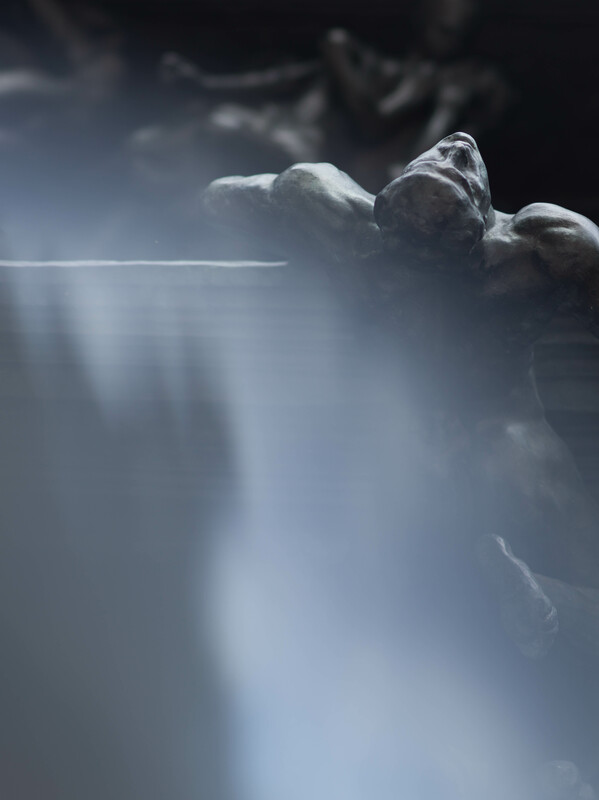 To do justice to the transgressive artist that Rodin used to be, Bruno Aveillan invents a new audiovisual form, melting his dancers’ bodies with Rodin’s masterpieces. Refusing the convention of the documentary genre, he includes in his film fictitious sequences to create a deep empathy with the spectator, within a synesthetic spirit in the Baudelairian sense of the word. Above all, the editing retraces Rodin’s creation process. Rodin indeed is the one who invented modern sculpture through the creation of a “unique way of re-assembling figures” as the poet Rainer Maria Rilke said. In the same manner – but with other means and materials – Bruno Aveillan has decided to assemble a huge variety of images, giving birth to unexpected revelations and to a living artwork. 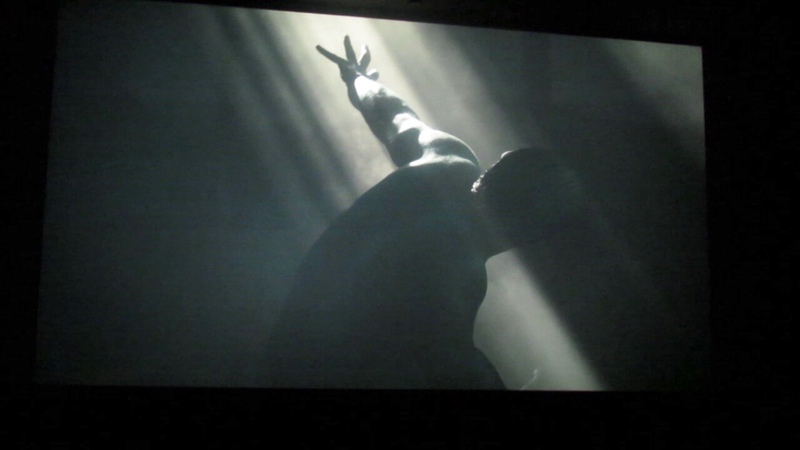 This is why, according to Jean-Baptiste Chantoiseau, this film in itself is a kind of « assemblage » – which is may be the best possible way ever to be faithful to Rodin’s artistic gesture and philosophy. The public was as well impressed by Mircea Cantor’s performance in the film. This romanian-born artist, specialised in video, animation, installation art and readymade objects created a drawing of Rodin’s Gates of Hell with a dynamite wire on a Plexiglas plate. After activating the wick, the fire gave birth to another Gates of Hell; a living one made of flames. Shooting such a performance just in front of Rodin’s original Gates of Hell enabled Bruno Aveillan to create a three-dimensional effect and then to obtain a sculptural rendering so relevant to his topic. The relation between « what is “truth” and what comes after it », to quote the organizers’ argument, was as well at the heart of the discussions that came after a screening particularly noteworthy and indelible. © 2018 – Bien en place editorial team. © On the left, photography by Bruno Aveillan ; on the right, by Nicolas Gouhier.